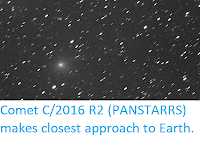 Sciency Thoughts: Comet C/2015 O1 (PANSTARRS) makes its closest approach to the Earth. 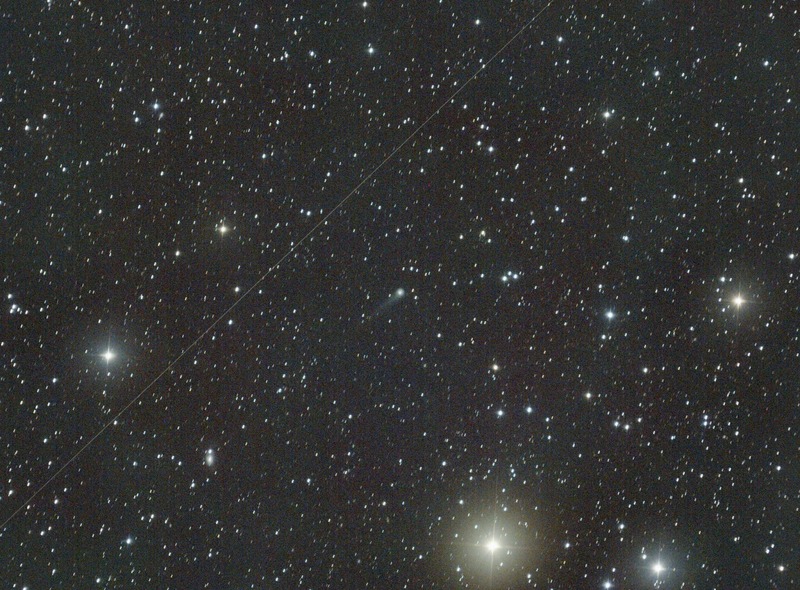 Comet C/2015 O1 (PANSTARRS) makes its closest approach to the Earth. Comet C/2015 O1 (PANSTARRS) makes its closest approach to the Earth on Thursday 5 April 2018 reaching a distance of 3.23 AU from the Earth (3.23 times as far from us as the Sun, or 483 687 000 km). 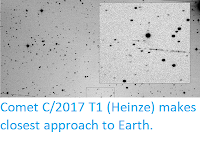 At this distance the comet will not be naked eye visible, having a magnitude of 14.34, which means it would require a good telescope to observe it, and then preferably in the Northern Hemisphere, as it is currently in the constellation of Bootes, which cannot be seen clearly from to far south of the Equator. Comet C/2015 O1 (PANSTARRS), imaged on 19 February 2018. Comet is small object at centre of image with a faint tail. 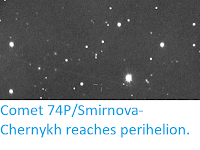 The elongate objects are stars, with the elongation being caused by the long exposure needed to take the photograph. Line crossing image is a satelite. Roland Fichtl/Seiichi Yoshida. 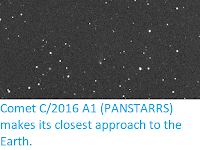 C/2015 O1 (PANSTARRS) was discovered on 19 July 2015 by the University of Hawaii's PANSTARRS telescope. 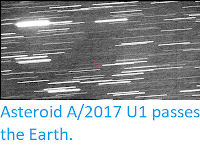 The name C/2015 O1 (PANSTARRS) implies that it is a non-periodic comet (C/) (all comets are, strictly speaking, periodic since they all orbit the Sun, but those with periods longer than 200 years are considered to be non-periodic), that it was the first comet (comet 1) discovered in the second half of July 2015 (period 2015 O) and that it was discovered by the PANSTARRS telescope. 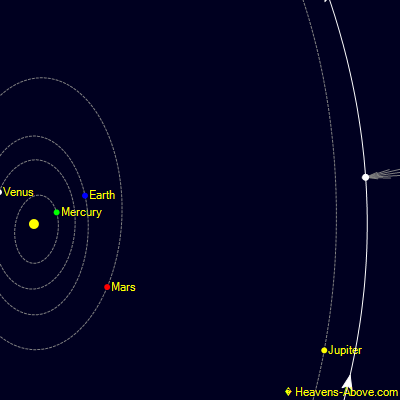 The orbit of C/2015 O1 (PANSTARRS) at its closest to the Earth. Heavens Above. 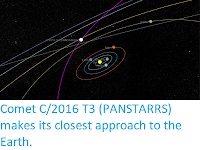 C/2015 O1 (PANSTARRS) has an estimated orbital period of 7 181 700 years and a highly eccentric orbit tilted at an angle of 127.2° to the plain of the Solar System, that brings it to 3.73 AU from the Sun at perihelion (373% of the distance between the Earth and the Sun, considerably outside the orbit of Mars); to 74 442 AU from the Sun at aphelion (74 442 times as far from the Sun as the Earth or 2550 times as far from the Sun as the planet Neptune), reaching the central part of the Oort Cloud. Share this to help a soul right now, Ya'll will agree with me that the rate of online scamming is increasing by the day. I'm also a victim of it as i was scammed about 25,000usd all in the quest of seeking for an home loan. I actually gave up until a government official directed me to PROSPER LOAN FIRM, Despite the fact of my plight i had to give it a try since it was coming from a top government official. All comment ya'all see online are crap, I know the pains i went through just because i was looking for a loan i had to keep on selling valuables to keep paying unforeseen fees. I and some great personality have started a movement to end online scam because people are dying everyday, losing their homes, selling their property just because they need a loan. Apart from been a beneficiary of about 295,000usd in PROSPER LOAN FIRM lending scheme , We have also made a research to see that they are the best around the globe as far as online lending is concern, They have proven their self trustworthy and reliable back to back without failing. To end people debt, financial burden and been victimized here is the details of prosper loan firm. Email: prosperloanfirm@yahoo.com OR call +1(816) 366-8769 to put an end to your financial needs now. I'm Heather Patrick from Georgia, United States.......... It doesn't take you anything to share this great information and good news. Email: prosperloanfirm@yahoo.com OR call +1(816) 366-8769 and celebrate financial outbreak for the rest of your life.